Some of the best outdoor advertising in Fairfield can be found on the I 80 billboards. Veale Outdoor Advertising is on the cutting edge of modern advertising technology, and can help you secure one of the top billboards available to broadcast the message of your business, event, or cause. We have been helping business owners since the 1980s. Each day, thousands of commuters travel along I 80, which hosts some of the best outdoor advertising space in Fairfield. Millions of people can see your message each month just by passing by on the freeway. 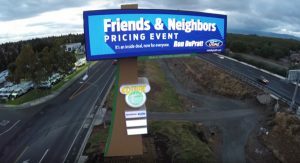 We have lots of experience helping small businesses, and believe no business is too small to have one of the area’s top billboards. Your business will see a spike in growth because your message is reaching an audience that is larger than you can imagine. Unlike radio and television advertising, which is limited to the station’s subscribers, listeners, or viewers, everyone can see your billboard as they pass by. Amongst our many options available, we offer both static and digital billboards. Digital billboards are seeing a surge in use because they are very noticeable and easy to modify as needed. If you have a weekly sale at your business, you billboard can be continuously updated to reflect your sales. With just a brief glance upward, commuters can easily be informed of your message. When you are ready to work with the best outdoor advertising agency in Fairfield, contact the professionals at Veale. We will work closely with you to thoroughly understand your business and its specific message, ensuring that we deliver the best possible advertising to your future customers. Give us a call today and prepare to take your business to the next level.